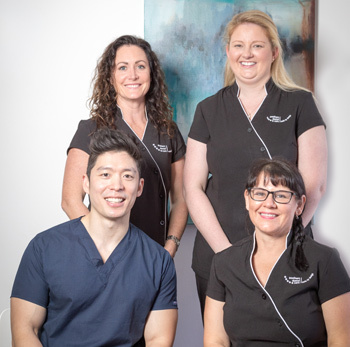 Established over two decades ago, Southern Dental Care – Smile By Design is an exclusively private practice committed as a centre of excellence. Principal dentist Daniel Chan has been at the practice for over 10 years. Daniel is a firm believer in minimally invasive and preventive treatment. Our fundamental belief is that preventive dental care along with rehabilitation is not a cost, but an investment in your future wellbeing. Some dentists specialise in various aspects of dentisty, but we try and specialise in the most important thing – people. We believe in trust and forming strong relationships with our clients so we can tailor treatment options to your needs. Most of our staff have been with us for well over 10 years. We are a small, tight knit team and when you become one of our patients you become part of our family. Most of our patients come to us by word-of-mouth referrals through our current patients. All of our services are performed locally. Only local labs, technicians, and the best materials are used, no matter the cost. We are not influenced by specific health funds, but all insurances are gladly accepted. In addition to providing general dental care, Daniel also offers expanded therapy options such as dermal fillers, wrinkle relaxers, facial rejuvenation, and much more. Does going to the dentist make you feel nervous? Our sleep dentistry options can help you to feel more relaxed during your care. Please share your concerns and dental history with us, so that we can better help you enjoy positive oral healthcare in the future. Find out for yourself what makes Southern Dental Care – Smile By Design different than everyone else. Contact us today to schedule a visit for yourself or a family member.